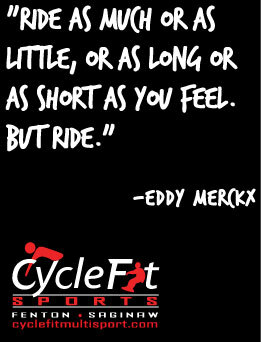 About Cyclefit Multisport Fenton ad Saginaw Michigan | Life's a cycle, ride it! Quality goodies, lickety-split service & no snobbery. Established in 2001, Cyclefit Multisport is one of the states leading full service bicycle and snow sports retailers. Known for service that exceeds expectation, our commitment remains in improving the Cyclefit experience for our clients. We believe in earning your business every single day, every single time. When you visit a Cyclefit store, it becomes clear that “these folks aren’t just trying to push product; ~they’re actually selling the activity first.” Be it triathlon, running, cycling, cross country or downhill, we are enthusiasts ourselves. We’ll always listen and learn what your needs are, then suggest a great match specifically tailored to you. Sure, there are some big dollar items in stock, but c’mon, these clearly aren’t for everyone, especially a family of four. We’re realistic, we’re very good listeners and above all we’re enthusiasts over salesmen. Here’s the company motto: “Quality goodies, lickety-split service and no snobbery” ~That sums it up pretty well, for us here at CycleFit Multisport.